In Maggie Stiefvater's Shiver, Grace and Sam found each other. Now, in Linger, they must fight to be together. For Grace, this means defying her parents and keeping a very dangerous secret about her own well-being. For Sam, this means grappling with his werewolf past . . . and figuring out a way to survive into the future. Add into the mix a new wolf named Cole, whose own past has the potential to destroy the whole pack. And Isabel, who already lost her brother to the wolves . . . and is nonetheless drawn to Cole. 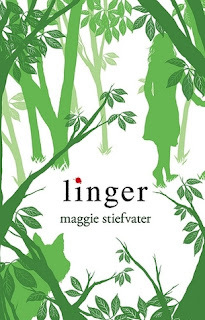 I really think I'm lacking in the 'love Maggie Stiefvater books' gene. This book put me to sleep not once, but twice... It's an alright story line, but the plot moves very slowly. And the romance? I honestly don't understand why everyone thinks Sam and Grace are the perfect romantic couple. I saw they were in love, but I didn't feel any sparkle shining out of those pages. Truly, I thought Grace's character was way too whiny for my tastes. And I felt like Sam was constantly brooding and getting nothing done. However, adding Cole and Isabel into the book made it a little more interesting. My personal opinion, I thought Isabel was the only person doing something worthwhile in the book. Did I like this book? Not really. Do I feel bad about it and wonder what on earth I'm missing that makes me not enjoy these books? Absolutely. Will I read the third one? Nope. Oh thank god I'm not the only one. I read Shiver a few months back (I have the entire trilogy on my bookshelf) and I for the life of me couldn't figure out what all the hype was about these books. I still haven't read Linger yet, maybe some day when I have nothing else to read.